Kosher cooking has been redefined for the modern family. 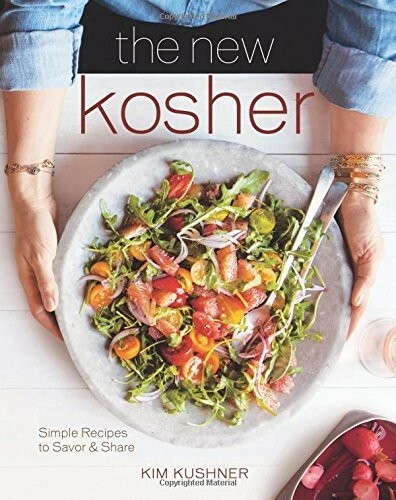 The New Kosher is filled with healthy recipes, exquisite flavors, and a fresh sensibility for the modern lifestyle. Emphasizing fast, easy, and delicious dishes for everyday meals and special occasions, this is your comprehensive guide to kosher cooking. Kim Kushner comes from a diverse foodie background and her easygoing, mix and match style has helped her redefine kosher cooking. With over 100 recipes from all over the world, there’s something for everyone in this unique cookbook. Looking for a modern twist on a traditional dish? Try Kim’s sticky date and caramel challah bread pudding, homemade challah with za’atar everything topping, 5-minute sundried tomato hummus or Mediterranean-inspired lentil, carrot and lemon soup. Trying to find a new family favorite? Whip up some coconut- banana muffins with dark chocolate, penne with lemon zest, pine nuts and Parmesan “pesto”, easy dill chicken and stew or a crispy rice cake with saffron crust. Need a dessert everyone will love? You can’t go wrong with recipes like deconstructed s’mores, crunchy-chewy-nutty “health” cookies, miniature peanut butter cups and dark chocolate bark with rose petals, pistachios and walnuts. Warmly written with personal narratives and detailed nuance, Kim’s recipes reflect her experience as a generous instructor who loves to teach and a mom who cooks tasty and nourishing fare for a big family.